If you are a homeowner who has been stuck with a listing that hasn't sold, and your contract has expired, you are a victim of an expired listing. An expired listing is a technical term given for a Dallas property that failed to sell through the MLS. It is essentially a property that did not receive a purchase agreement during its term or contract with a realtor and is therefore no longer active in the MLS. Although you may be experiencing a considerable amount of frustration over your unsold home, know that it typically comes down to one or two reasons. Your Dallas home did not likely sell because of either: (a) price or (b) exposure. An important part of the pricing strategy developed between you and your real estate agent is to take a good look at comparable sales in your area. In short, you and your real estate agent should work together to review the area's sales and listings over the last 12 months so you can understand the market conditions and for what price other homes in the area are selling. Many times Dallas homes fail to sell because they weren't given enough exposure by the listing agent. It is important to pay close attention to your agent's marketing efforts so you can be sure your Dallas property is receiving as much exposure as possible. It is vital, particularly in a buyer's market, to market a home effectively so it will be noticed by other buyers, as well as other realtors. Your agent may be limited to marketing because of a lack of marketing tools within the real estate company. If the real estate company does not have successful marketing tools in place then your home could be missing out on vital exposure – the exposure you need to get your Dallas home sold! If you have an expired listing and you don't know where to turn, it may be time to hand over your Dallas listing to a real estate company that has extensive experience selling expired listings. VIP Realty has the qualified agents and the marketing power to get your Dallas home sold! Expired listings may be challenging to some realtors, unless they have the knowledge and experience necessary to handle these types of listings. VIP Realty will reevaluate your home's previous marketing and pricing strategy so we can relist your home and achieve more success. We will use the power of the Internet –and our position as Dallas' premier real estate firm "” to adequately promote your Dallas property so you be sure your home is receiving a great deal of exposure. We will also carefully review other comparables in your area and, using that information, devise a pricing strategy and marketing plan to ensure your Dallas home will sell in the least amount of time and for top dollar! 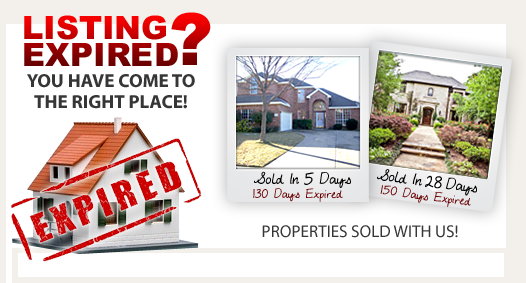 Discover why so many homeowners with expired listings have successfully sold their home through VIP Realty!